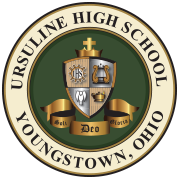 Ursuline High School is a Catholic college preparatory high school, operated by the Diocese of Youngstown that offers excellent academic and religious instruction in a positive school culture where all students feel safe and welcome. This atmosphere contributes to the spiritual, intellectual, social, and physical growth of our students. 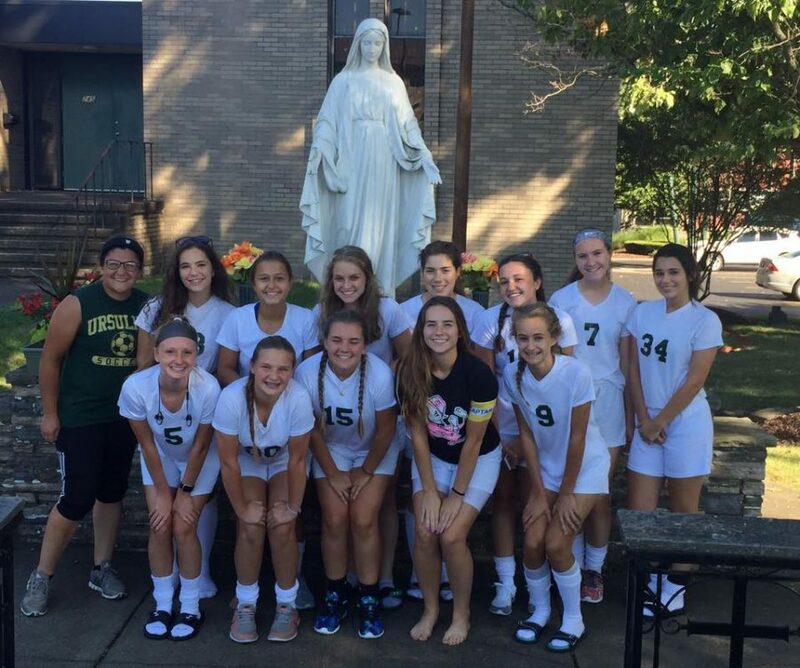 Ursuline admits students who demonstrate the ability and desire to succeed academically, a willingness to accept the challenges and expectations of our curriculum, and the commitment to embrace the school’s Catholic identity and participate in the spiritual life of the school. 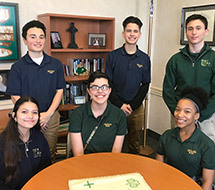 Once the above items have been submitted and satisfactorily reviewed by the Ursuline administration, an interview with the Assistant Principal will be scheduled for the student and his/her parent or guardian. Following the interview, an admission decision will be made by the Ursuline administration and conveyed to the parent/guardian. * Students who attend any elementary school in the Diocese of Youngstown will take the test during the school day at their respective school. It is not necessary to take the test at Ursuline. Any prospective student from a public school district must register to take the test at Ursuline High School. Families considering Ursuline High School are encouraged to attend as many Ursuline events as possible to learn more about the value and benefits of an Ursuline education. Specific events planned for future Ursuline students and their families are detailed under Events for Prospective Families. Especially informative for prospective families is the Parent Information Night on November 7, 2018 and the Open House on Sunday, February 9, 2019. If you are not already receiving mail from Ursuline, please fill out the Request Information Form, and you will be added to our mailing list. Incoming freshmen who do not attend an elementary school in the Diocese of Youngstown are required to take the placement test, which helps the school administration to determine appropriate courses for each student. This exam will be held Saturday, November 17 and Saturday, March 30 and from 8:30 to 11:00. Students should bring several number two pencils and a calculator with them. Reservations for either placement exam can be made by contacting the school office at 330-744-4563. Following Ursuline’s Open House on February 9 from 1:00-3:30, members of the administration will host the Catholic elementary school students, regardless of their feeder school affiliation, and their parents on Thursday, February 21 at 6pm and Saturday, March 9 at 10:30am to complete the registration process. These events will be held in the Ursuline Library and Learning Center. Parents are encouraged to RSVP for one of the two events by visiting www.ursuline.com/calendar and selecting the date of their choice. If neither event works for a family’s schedule, please call Ms. Maggie Matune at 330-744-4563 to make other arrangements. Parents will receive more specific information about these events in January. Students not enrolled in a Catholic elementary school, should contact Ms. Maggie Matune, Assistant Principal, at 330-744-4563 for information about the registration process. Applications from students who attend public and other area private schools will be reviewed by the administration and a follow up meeting will be scheduled. Completed applications may be dropped off at the Ursuline Office Monday – Friday from 7am-4pm. Financial Aid Applications will be available beginning Sunday, February 9, 2019 at the Open House or by calling the main office beginning Monday, February 10. Financial Aid Applications are due in mid to late March. The exact due date will be announced in January. Late applications will be accepted, but will only be considered after all applications turned in on time have been processed. Notifications of financial aid awards are mailed to the student’s home in early June. No student will be considered for financial aid unless they are a registered student at Ursuline High School. Students transferring from other high schools will be considered for enrollment on an individual basis. Students wishing to transfer to Ursuline must submit transcripts and the most recent report card from their current school. These materials will be reviewed by the administration, and the family will be scheduled for an admission’s interview with Ms Maggie Matune, Assistant Principal. For further information, contact Lisa Yurcho at 330-744-4563.